A big crowd was on hand for the groundbreaking for the new Sable Lodge resort retirement community last week, including South Portland Mayor Tom Blake and interim City Manager Don Gerrish. Sable Lodge, on Executive Drive, adds a large apartment project to the mix in the Maine Mall area. Nearly two years ago, Resort Lifestyle Communities, based in Nebraska, announced its plan to build an upscale, $30 million, three-story, 128-unit congregate housing project for those 55 and older off Running Hill Road in South Portland. 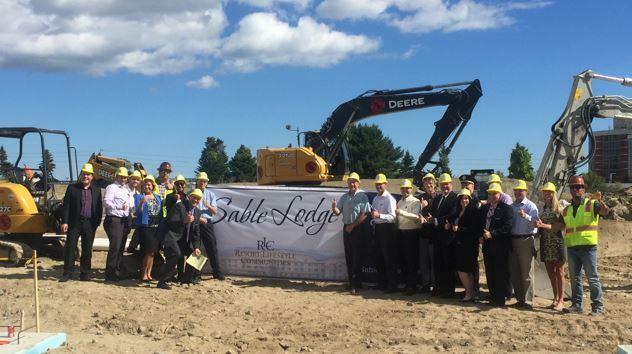 The project, now called Sable Lodge, broke ground last week with a ceremony that included a number of officials from South Portland, including Mayor Tom Blake, Don Gerrish, the interim city manager, and Josh Reny, the assistant city manager and economic development director. The approval process for the project included a zone change on the almost 10-acre building site on Executive Drive, plus special permitting from the Planning Board. Now, depending on the weather, Resort Lifestyle Communities hopes to have the facility up and running by late summer or early fall of 2017. The project is the first in Maine for Resort Lifestyle Communities, which offers its residents an all-inclusive style of living, including 24-hour dining, 24-hour concierge services, weekly housekeeping, valet parking, a 150-seat movie theater, fitness center, a library, coffee shop and more. In addition, the facilities all boast live-in managers, activities and lifestyle managers, transportation for those who no longer drive and day trips. Each unit also includes a full kitchen, washer and dryer hook-ups and patio and balcony options. The congregate housing communities are also pet friendly, and the monthly rent includes all water, electric, gas and cable television fees. In the press release, the company also said it would “provide an array of significant long-term benefits to the South Portland area,” including creating 40 local jobs. Those activities, according to Hinrichs, would include arts and crafts, lectures, clubs such as gardening, walking or bridge, games, local volunteer work and day trips. “We also will have a state-of-the-art, 150-seat movie theater that will host movie afternoons and evenings, live entertainment, large sporting event parties, lectures and even church services,” she said. This is an out-of-state Resort Lifestyles Community project. South Portland will be the company’s first Maine location.